I have to admit that until the company contacted me recently, I have never even heard of Movavi Video Suite. This is perhaps not too surprising since there are so many video editing packages now available for Windows that it is becoming increasingly difficult you keep track of them all. Given the intense competition in this field, the first thing I wanted to know is whether there is anything that differentiates Movavi Video Suit from its rivals? What this actually means is that you get a fairly simple video-editing package and screencast-recorder plus a few associated tools to save in various image, video and sound formats. But is that really enough to make this program stand out from the crowd? The principal application is the video editor. This gives you a few tracks arranged on the timeline – two tracks for video, two for sound. You can drag clips onto the tracks and use the second video track for ‘picture in picture’ effects (one clip running in a small rectangle overlaying the main clip). You can move, cut and copy clips and you can add transitions to fade one clip into another or apply effects such as ripples, slides, zooms and so on. You can also add text and animations to another track. These may include ‘speech bubbles’ and ‘thought bubbles’, animated intro sequences. The text and font-styles can be edited in the preview window. Movavi Video editor has most of the other features you’d expect in an entry-level video editing package, such as filters to change colours, add blurs, apply a ‘sketch’ effect or lens flares; pan-and-zoom to magnify or move across a video; the ability to add images – either loaded from disk or in the form of drag-and-drop ‘clip-art’; it has a number of animated annotation such as arrows, circles and boxes (very useful if you are making tutorials in which you need to highlight certain things shown on screen); and it even has a key frame animation capability which lets you select elements and smoothly animate them across the screen between two locations at two time-points marked onto one of the clips in the timeline. It has a video stabilizer to remove camera shake plus a reasonably effective Chroma key (green screen) tool that lets you make coloured backgrounds transparent. 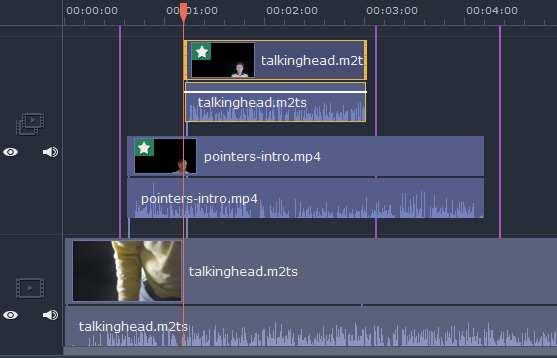 This is useful if you want to add a ‘talking head’, for example, over some other background video. Note that only two tracks are available for video clips. However, the ‘picture in picture’ track rather oddly allows multiple clips to overlay each other – which is a bit like having extra video tracks even though they are not shown as such. Some video suites offer dozens of video tracks; that might be useful for complex projects. But to be honest, for home and online videos, most of the time one or two video tracks will be sufficient. For very ambitious video projects, however, the two-track limitation may be a barrier. Another limitation is the lack of support 360-degree videos (recorded by cameras with 360-degree functionality), though the company does have a different product that has this capability. The software supports a good range of import/export formats including all the most popular video types such as MP4 (in several ‘flavours’), AVI, MOV, MPEG-1, MPEG2, WMV and many others. Audio conversion is also provided to save sound files in MP3, WAV, AC3 and so on. 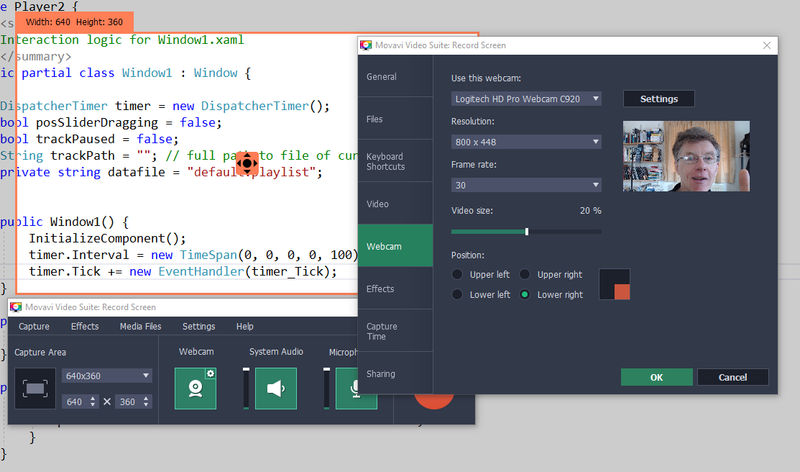 The suite include screencasting utilities. There is a decent screen capture tool that lets you select areas of the screen, optionally including webcam video capture, and it can include mouse-click highlights in the screen capture. This is a simple, straightforward and effective tool. In addition, there is also a dedicated webcam recorder which, however, has the annoying side effect of producing audio feedback (a loud hooting noise) if you forget to disable the PC speakers when recording. This is bizarre since the webcam recorder that’s integrated with the screencast recorder doesn’t suffer from audio-feedback. Movavi Video Suite can also record sound, burn audio or video to CD, DVD or Blu-ray and create slideshows from a series of still photographs. The software provides alternative ‘easy’ or ‘full’ user interfaces. 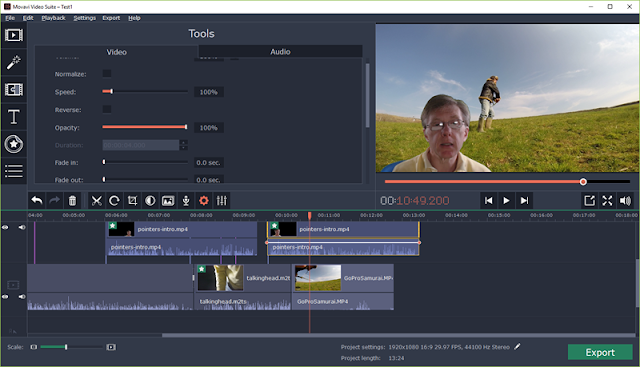 If you choose the full interface you are presented with the complete video editor. If you choose the simple interface, you are shown some task-specific dialogs. For example, when creating slideshows, the easy interface lets you select images, optionally add some music and then it generates the slideshow complete with animated transitions. In summary, Movavi Video Suite is a good tool for making home or YouTube videos or screencasts. 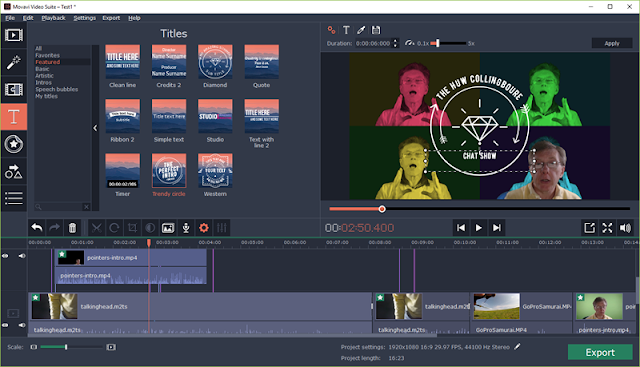 It is fairly limited in functionality so don’t expect to have all the editing tools you would get with more complete video editing suites such as Adobe Premiere or Magix VEGAS. On the plus side, however, it is really, really easy to use. 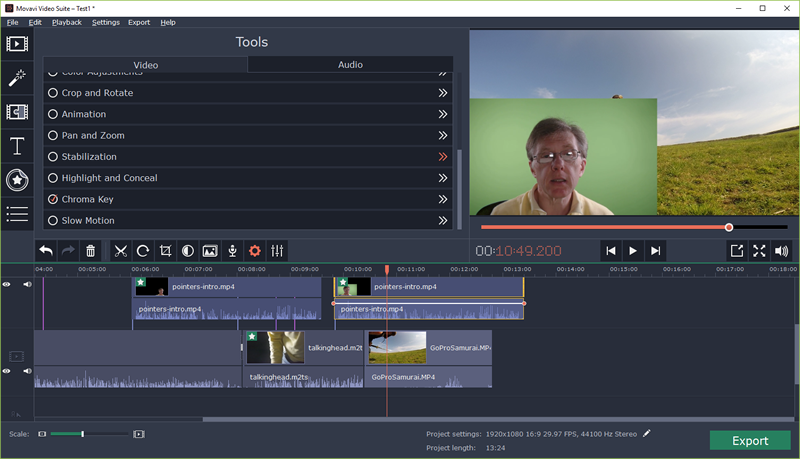 Even fairly user-friendly video editing packages such as Cyberlink PowerDirector or Corel Video Studio can be intimidatingly complex for the newcomer to video production (see more video editor review HERE). The learning curve of Movavi Video Suite is much less steep than for those programs. So, while this is definitely not a program for professional-grade production, it would be a very good choice for the non-specialist user who wants to get editing projects done quickly and easily. 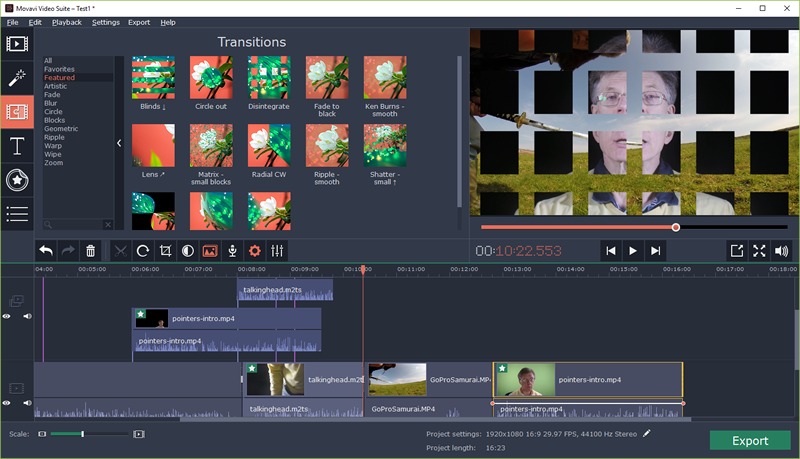 If you are interested in video making software, there’s a free trial available, so if you aren’t sure if this is right for you, test it out first.